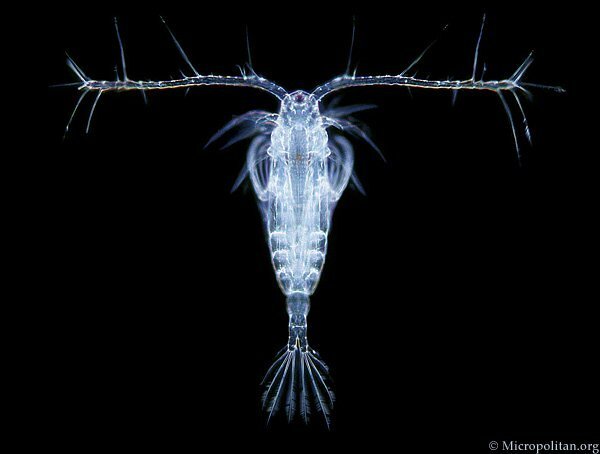 The mighty Copepod is the Super food of the Ocean. This subclass of Crustecean, Copepoda, make up the largest biomass on earth. ; this fact alone is indicative of the critical role copepods play in the health of the earths water sources. Much to many peoples surprise, Copepods are not limited to oceans. Copepoda live swimmingly well – in both freshwater as well brackish water. Copepod varieties are well over 10,000 with these small yet durable creatures boasting one of the must robust adaptation abilities known to man. Not only are they the largest single component of the food web, but they are also the fastest animal on the planet relative to their size. Comparatively – if a person could jump 1/2 of a mile in 2 seconds, humans would earn the coveted title of fastest creature. Copepods have all of us beat, hands down. As they are a highly sought after food source, their ability to out maneuver predators has marked their success in the game of cat vs mouse. Copepods also commonly referred to as Pods, need only a small quantity of moisture to sustain life. They have been found in moist moss as well as polar regions. In 2004, the New York Times wrote about a small crustacean found in the drinking water in NY City. Our forever friend, the copepod, caused quit a ruckus as many orthodox Jews were concerned about the small crustacean and the “Kosher-ness” of their kitchens. Water Filters were installed at such an alarming rate the wait time was several weeks as the plumbers in the NY City area struggled to keep up with demand. Copepods are also Environmentally friendly. Scientists estimate that copepods are the largest absorber of carbon, valued at 1-2 billion tons of carbon each year. Since they release less carbon waste then they absorb, this gives the humble Pod the well earned nickname carbon sink, defined by Wikipedia as a reservoir which accumulates more carbon from the environment then it excretes. As a key component in the nutritional well being of many animals, the amazing aspect of pods is their sheer percentage of protein they bring to the dinner table. Pods are one of the most nutrient dense organisms on the planet at an average of 50% Protein. Animals, such as, seabirds, invertebrates, both freshwater and saltwater, as well as whales & many other fish, survive primarily on a diet of pods. . When considering what these small but mighty creatures will do for your reef tank, consider this: Uptake of waste, super food of protein value, and a natural super organism. Why would you not wan them in your tank? Considering all that they do and are responsible for, it is easy to say that copepods are the most important creature we can own. Copepods & Amphipods: Fun Facts that will blow your mind! Banggai Cardinalfish – Is this the Fabulous Reef Safe Fish you have been looking for in your reef tank? Not feeding your Corals ? We break it down so you can fatten them up! A fat coral is a happy coral! Saltwater Hermit Crabs …. Eating Cyano & Waste …. Best Crab Ever!